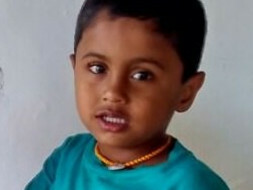 Fundraising deficit amount for Cochlear Implants for son of a widow. My 4 year old nephew Master Shankargowda has been diagnosed with Profound Bilateral Sensor Neural Hearing Loss and has been advised "Cochlear Implantation Surgery". From the time of birth, he is not able to hear & also not able to talk. After consulting the best advisers, the only hope for him is to undergo the above said procedure. Unfortunately, he lost his father in an accident 7 months ago. His mother is a housewife and has no educational qualifications to hold a job to bring up the family. After lot of negotiations, the cost of Cochlear implants is Rs. 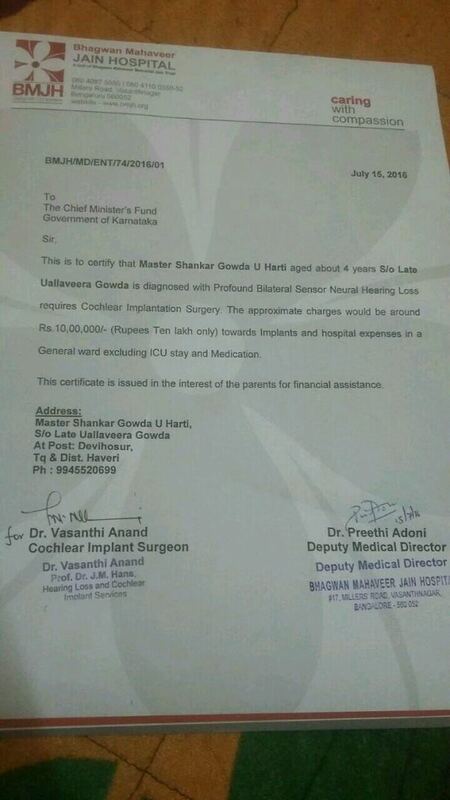 20 Lakhs (10 Lakhs for each implant). 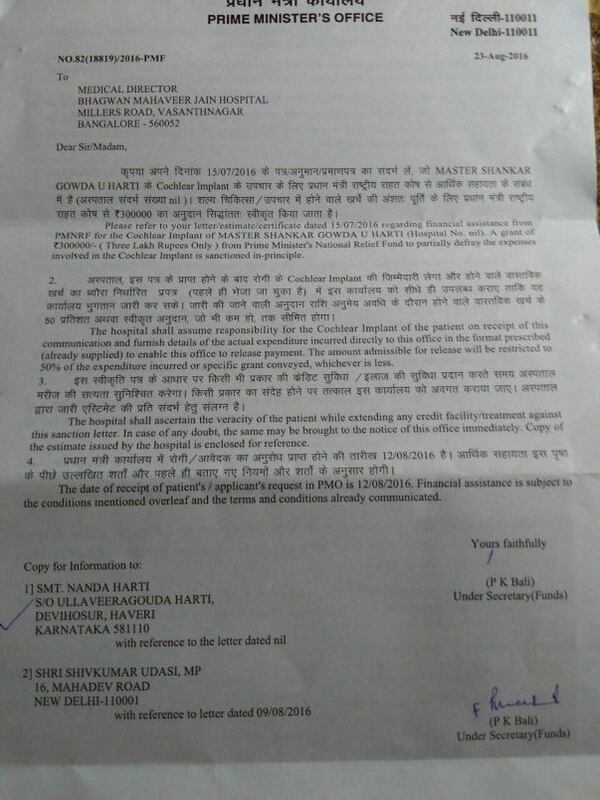 I have managed 3 Lakhs personally & We have received PM Fund grant letter for 3 Lakhs. We have received 4 Lakhs as cover for his father's accidental insurance after death. So the deficit amount now is Rs. 10 Lakhs. We have been trying to raise money through various means but we are finding it a very big challenge. Please help us in fundraising. Please get help from social media and help this kid. Funds will be utilized for Bi-lateral Cochlear Implant and this surgery as this procedure is only hope left for my nephew & my sister to lead a good life. 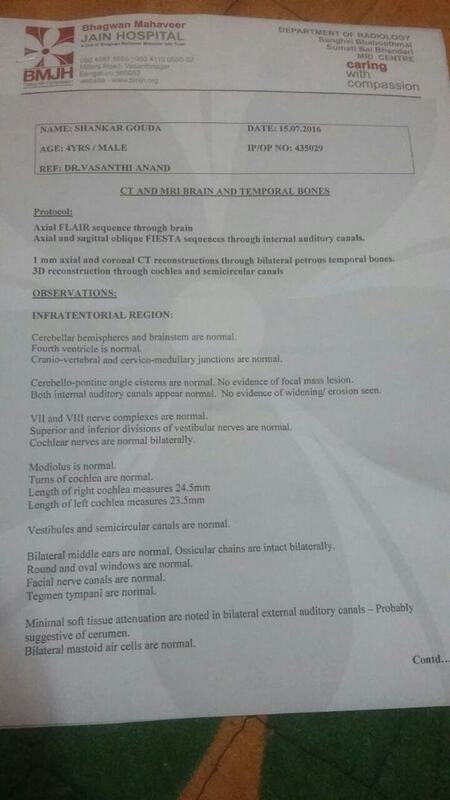 Please find supporting documents attached. Hi dear donors. I am very grateful to all of you for such a noble and generous help. 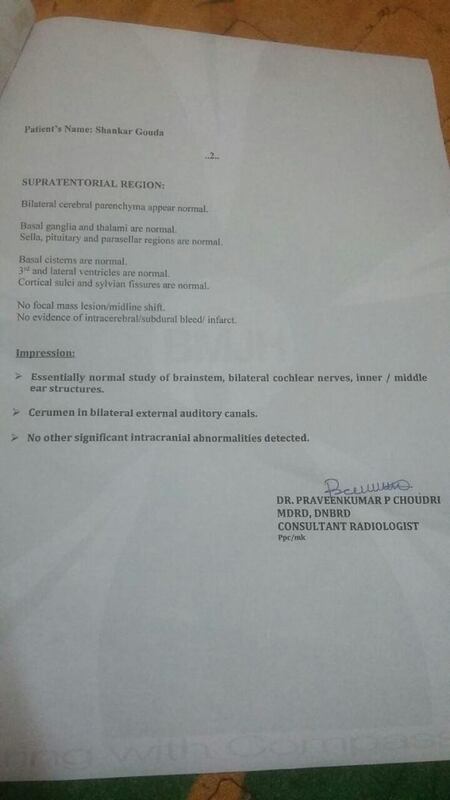 Mast Shankaragowda underwent successful bilateral cochlear implant. With your blessings the system was switched on on 10th January 2017. The child started hearing and will be on speech therapy for a year. By the end of year he should be able to speak. I will post his speaking video once he does so. I am Dr Chandragouda . Firstly, I'd like to sincerely thank you for your amazing support and generous help. This is to update you on the child. The surgery has been postponed to 22nd Dec, 2016 (22/12/2016) as operating Doctor Padmashree Hans was not availabe on 8th,Dec,2016(08/12/2016). I will be sure to post an update again after the surgery .